A new add-on levelpack has been added to the Soko Banish downloads section, complete with its own graphics theme and music. 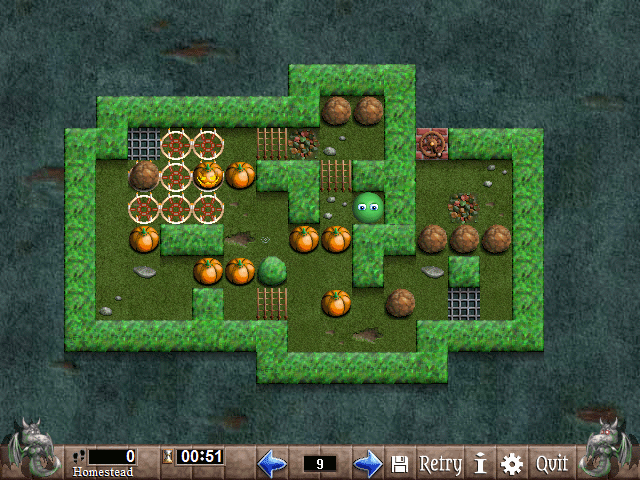 Arrange pumpkins in 20 all-new levels using elements like orb traps and breaking floors, but don't get spooked... Enjoy, and Happy Halloween! If you too have new levels to share, please send the zipped up levelpack folder to my contact email and I'll see if I can post them. 03 Aug 2018 Soko Banish 1.5 is here! 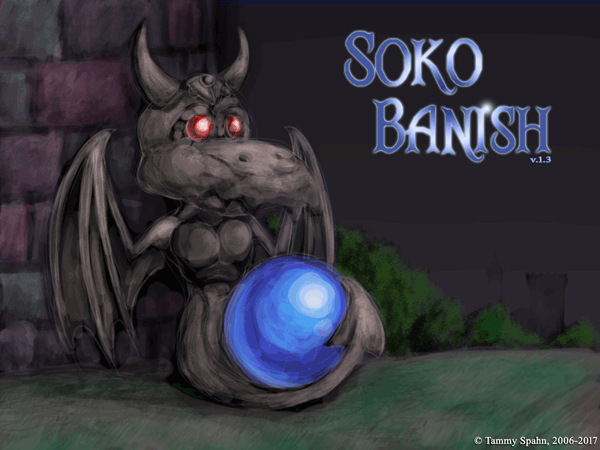 Soko Banish 1.5 has just been released, adding features like custom skins, solution saving and basic point & click mouse controls. Go grab it on the Soko Banish page! The Level Creator has also been updated to 1.4.1 to offer better support for the new skins and fix a few bugs - it's a separate download, so remember to update it as well. The next (and possibly final for a while) version of Soko Banish is in the works, bringing with it exciting features like custom skins and saving solutions. Check out my blog post for a quick rundown of what's coming! And much more! It also fixes many bugs and issues remaining in the previous version and adds new cobweb decorations to use in your levels. As usual, you can update your editor by downloading the latest version and replacing your old "levelcreator.exe" and "edithelp.txt" files with the new ones. A complete list of changes can be found in the updated help file. Enjoy, and don't forget to share your creations with us! Some people have been encountering crashes when trying to go past the title screen in Soko Banish and it seems to be related to the game being installed in C:\Program Files (x86)\. If you are having problems playing the game, please make sure it's NOT installed in Program Files (x86)! I have removed it as the default installation directory, but I may not be able to fix this (quite puzzling) behaviour, so be sure to avoid that folder as a work-around. 31 Mar 2018 Upcoming Editor Stuff! The Level Creator for Soko Banish is getting an enormous update, adding much-needed features like level testing, undo/redo and a more comfortable way of managing levelpack info, level order and custom graphics, as well as tons of bugfixes. Excitement! Check the blog for a quick overview of major features. There's still a lot of testing to be done, but the new version should hit sometime in the next weeks. Be sure not to miss it when it's out! Patch 1.4.2 for Soko Banish has just been released. 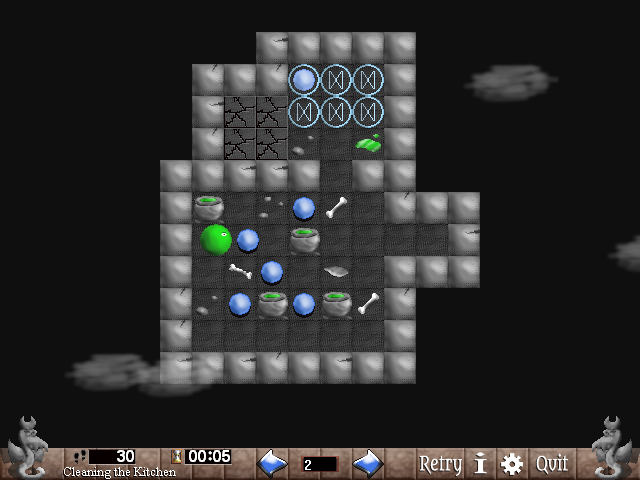 It is largely a bugfix patch that also replaces one level and makes some small improvements to the graphics. Grab it here: Soko Banish game page. Soko Banish has received an update, fixing bugs and adding features, notably the ability to track your best times/steps on your profile. Grab the new patch on the game info page to upgrade! - Best times and steps are now saved and shown (if enabled). 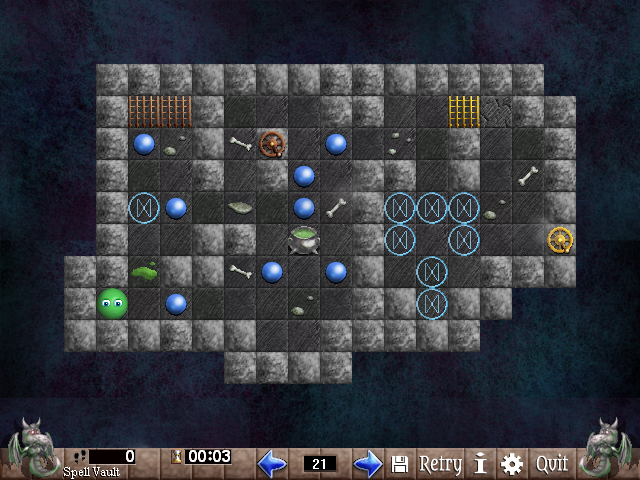 - Stand-alone levels can be played by dragging files on the program. - Undo/redo is much faster when held down for many steps. 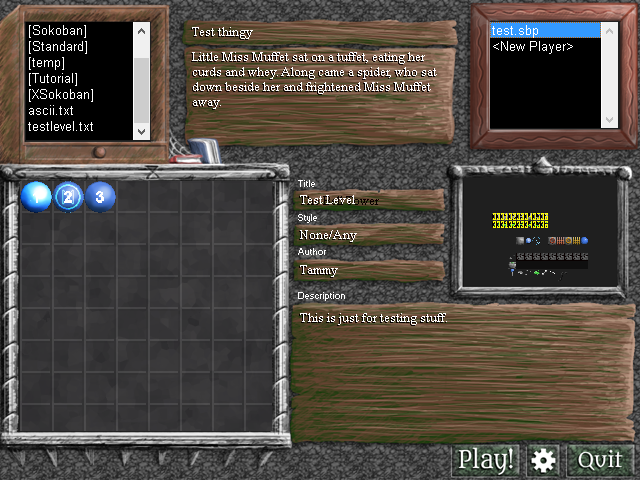 - Level list can now be scrolled up/down with the mouse wheel. - Fixed a bug with tracking progress in packs without a levels.txt. - Pack description looks better and no longer flickers. - Fixed a problem with the leaf effect graphics. - "void.jpg" background tiles better; "snow.jpg" less blurry. - Darkness effect is slightly brighter. - Temporary files are cleaned up once more. 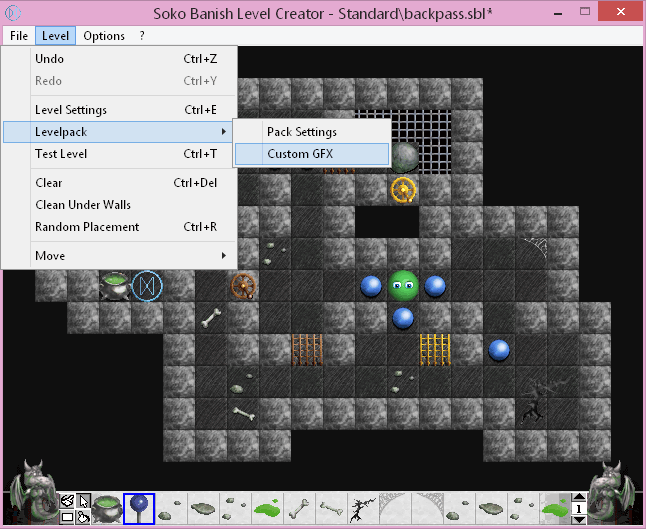 The Level Creator for Soko Banish has been updated to v.1.3.2. The new version comes with minor improvements and various bugfixes, mainly related to the ASCII import function, level size and save prompts. To update, simply download the latest version and replace your old "levelcreator.exe" and "edithelp.txt" files with the new ones. A complete list of changes can be found in the updated help file. 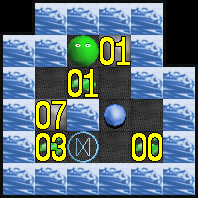 A new add-on levelpack has been added to the Soko Banish downloads section, containing 100 new classic Sokoban-style puzzles by Tammy Spahn (that's me). Most of them were created through a mixture of manual design and using a generator to find more difficult solution paths, and some are quite tough as a result. Go check 'em out! 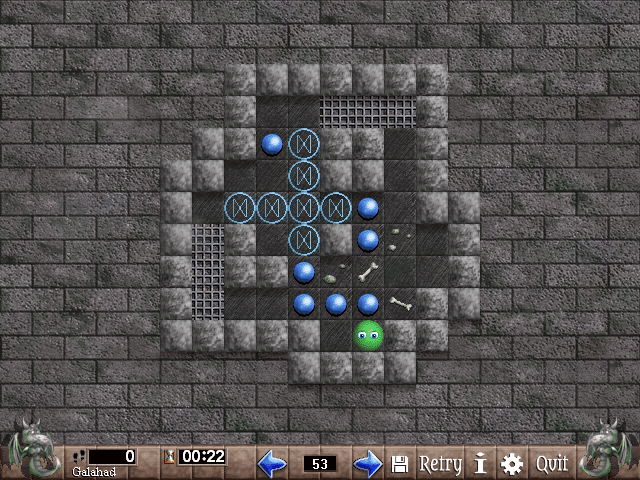 The Level Creator for Soko Banish has been updated to v.1.3.1. The update fixes various bugs and minor glitches, mostly relating to changing level sizes and browsing levels via the next/previous menu options. To update, simply download the latest version and replace your old "levelcreator.exe" and "edithelp.txt" files with the new ones. A complete list of changes can be found in the updated help file. 22 Aug 2017 Soko Banish 1.4 is here! The newest version of Soko Banish is now up for grabs! 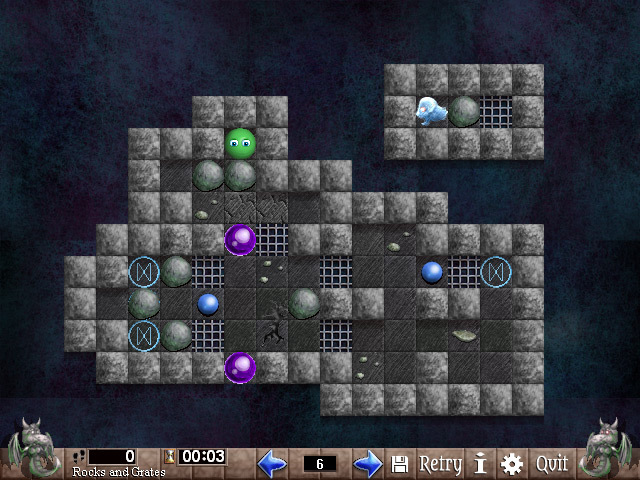 Featuring a complete overhaul of the game's visuals, new game elements, support for larger puzzles, improvements to the Standard level pack and much, much more. Get it here! The Standard level set is being updated and rearranged in the upcoming release of Soko Banish! Several puzzles will be fixed & improved, and playing them in order should provide a more coherent experience. I talk about my thought process here. 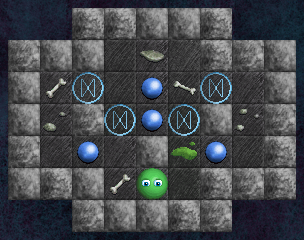 Introducing Rocks and Grates, two new puzzle elements in the next major release of Soko Banish! 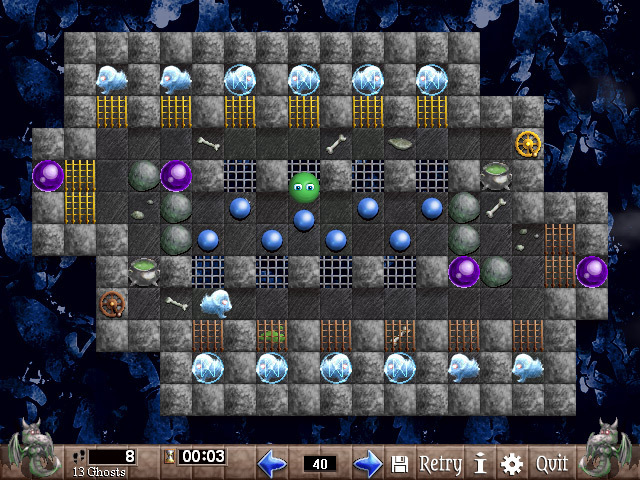 Rocks are obstacles that can be pushed like soulstones, while Grates are special floor tiles that can be walked across, but not pushed across. Read more on the Blog! Soko Banish is receiving a complete overhaul in the upcoming major update, so I decided to write up a little blog post and showcase some of the new graphics. Go take a look! 03 Aug 2017 Soko Banish 1.4 - The Future! Development on Soko Banish 1.4 is officially underway! This next major content update will bring much needed improvements like larger levels, new in-game graphics, saving level states and a whole lot more. There is no release date yet, but we'll keep you updated here and on the Lanschilandia Games Twitter. You can also expect a few behind-the-scenes blog posts as I cover the upcoming changes and additions to the game, so stay tuned! - Walls no longer disappear when switching to fullscreen mode. - Screen resolution now resets when fullscreen game loses focus. - Fixed a bug that caused Ardos to revive if he died while pushing. - Ghosts don't quiver when moving against a wall anymore. - The floor tile graphics are once again randomised. 13 Jul 2017 Soko Banish 1.3 has Arrived! Big news about Soko Banish! Version 1.3 has just been released and can be downloaded on the game's info page. If you haven't been keeping up with it, this is a major update introducing a new level select screen and GUI, player profiles to track progress, better undo functionality, a massively upgraded editor, custom tiles and much, much more! Check the readme.txt included with the game and edithelp.txt included with the Level Creator for a list of changes, or just try them out and see for yourself. Now go and solve puzzles old and new! Greifenhausen needs you! Soko Banish 1.3 is getting a new title screen! With all the vital GUI functions moved to the new level selection interface, I've been whipping up a splash screen to replace the old title menu in Krita. It's also making me want to overhaul the in-game graphics so the game itself looks a bit more like this, but that won't be happening for a while to come. Here's the new status bar and settings menu for Soko Banish 1.3. Essential GUI functions are finally where they should be - and actually in the game at all! Also showcased are the new step counter and timer, which are both optional for those who care about such stats. Read more on the blog. As promised, here's a blog post about Soko Banish 1.3's new level selection interface as it currently looks. There are a ton of new features to be excited about - or maybe just to realise how much they had been absent in older versions. It's turning into a much more polished game, so go take a look! Other projects are getting in the way (looking at you, Tails of Lanschilandia), but there are exciting additions I can't wait to post more about once they're a bit more finalised. Stay tuned! 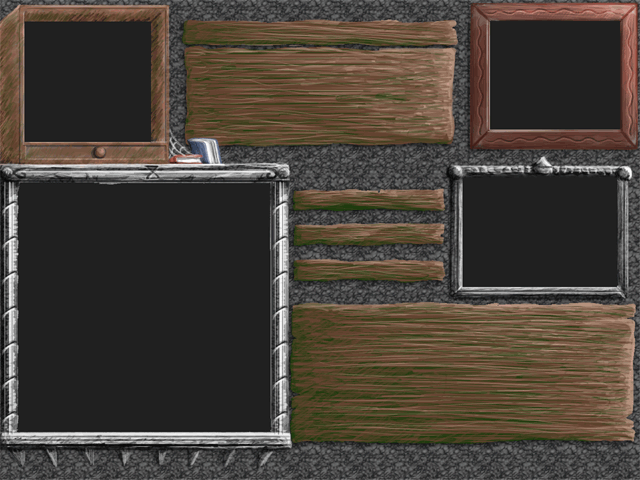 Soko Banish 1.3 now supports custom graphics for walls and decorations! 64 template tiles have been added to the editor - if the game detects PNG images with certain filenames in a level pack folder, those will be used as the tile graphics, allowing users to build levels with unique looks and details. Read more! 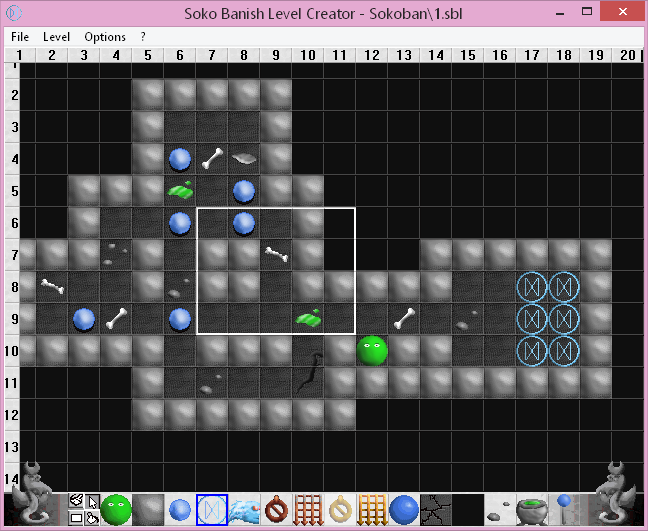 Here's a a first good look at the Soko Banish Level Creator in its current development state. 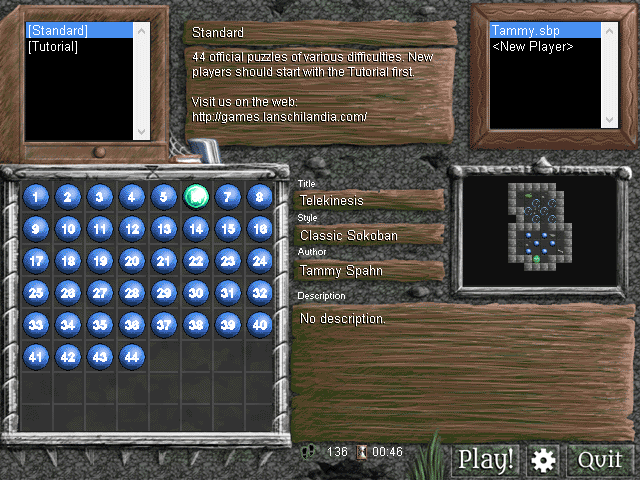 Note the new (optional) grid and rulers, graphical changes, more elements on the toolbar and most importantly the assortment of editing tools to pick from in the lower left corner: Draw, Select, Rectangle and Fill. I'm pretty excited about these new features, which should speed up level creation immensely when the new editor is out (especially compared to the clunky 1.0 release). As it cannot save files in the .sok format used by the current game version anymore, that will have to wait until Soko Banish 1.3 is ready, however. Read more about the new tools on the blog! 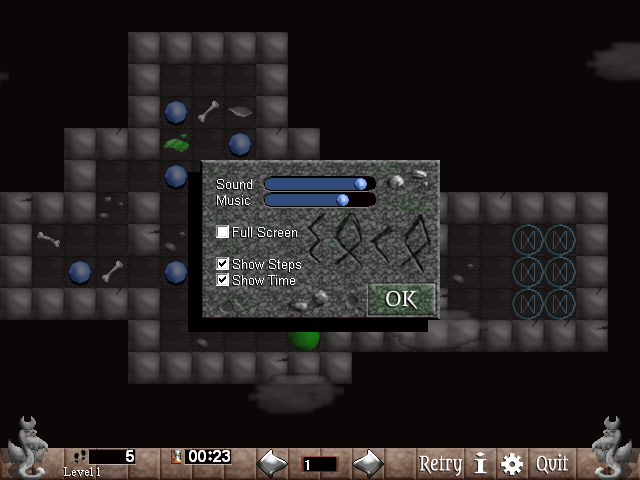 For the next Soko Banish release, one of my top priorities is updating the outdated Level Creator, which saw very few changes from its 2006 release in the recent revival of the game. While the most major and important change is replacing the old level format with something smaller and more dynamic, something much more visible and neat being implemented right now is the new toolbar! See this post on the blog to find out what's happening with it.